As to the functions of other SRP subunits, the 9/14 dimer located in SRP at the other end of the elongated particle, opposite to SRP54 subunit (Fig. 18.6), seems to be responsible for the arrest of elongation. This may be realized through direct interaction of the 9/14 dimer with the ribosome concurrent with the binding of the signal sequence by the SRP54 subunit. Such two-point binding with the ribosome/nascent chain complex could hinder structural rearrangements normally occurring in the ribosome during translation. A putative physiological significance of this particular function of SRP is that the nascent chains are prevented from completion and ultimate folding prior to their translocation across the endoplasmic reticulum membrane. Though post-translational translocation is allowed in the lower eukaryotic cells that have a specific translocation apparatus for this purpose, it seems to be rather unusual in the higher eukaryotic cells. The 68/72 dimer, occupying the central part of SRP, somehow mediates insertion of the nascent chain into the translocation apparatus. The SRPs containing damaged SRP68 and SRP72 subunits still bind the ribosome/nascent chain complex and arrest elongation, but they fail to provide transmembrane translocation of the nascent chains. This is considered to be a result of the inability of such modified SRP to interact with its receptor on the endoplasmic reticulum membrane (see below). In other words, the 68/72 dimer is obligatory for translocation of the nascent chain across the membrane at the stage of the docking of the ribosome/nascent chain/SRP complex to the membrane. Besides, as SRP devoid of SRP68 and SRP72 cannot arrest elongation, this bulky dimer seems to be crucial for maintaining a correct conformation of SRP as a whole. The existence of the three regions in SRP responsible for its three functions (signal sequence reception, translation arrest, and transmembrane translocation) corresponds nicely to its shape seen in the electron microphotographs. Yeast cells contain very similar SRPs regarding their size and constituent protein subunits. In contrast, the bacterial analogue of the SRP is much smaller and includes only 4.5S RNA and a SRP54 homologue, the so-called Ffh. As compared with the eukaryotic 7S RNA, the Alu-like region is absent from the bacterial 4.5S RNA. Consequently, the Ffh/4.5S RNA complex is able to bind nascent chains with signal sequences, but it cannot arrest elongation, seemingly because of the absence of corresponding protein components bound to the Alu-like domain (see Fig. 18.6). The Ffh/4.5S RNA complex serves to maintain a nascent chain in a translocation-competent form and to target it to the plasma membrane. Membrane protein FtsY is a putative receptor of the Ffh/4.5S RNA complex that is involved in cotranslational transmembrane translocation of some bacterial proteins. binding protein SRP54. M and G are two domains of SRP54. The SRP54 is bound with helix 8 of the 7S RNA by its domain M. The signal sequence (designated as black zigzag) emerging from the ribosome interacts with domain M in the inter-domain cleft. (H. Lutcke, Eur. J. Biochem. 228, 531-550, 1995). The mammalian ribosome/nascent chain/SRP complex is targeted to a unique receptor located exclusively in the endoplasmic reticulum membrane. The SRP receptor (SR) is composed of two subunits. The a subunit is a 69 kDa protein, the bulk of which (a 52-kDa fragment) faces the cytoplasm, while the amino terminal part spans the membrane. The cytoplasmic region of SRa, interacting with SRP, has a site for GTP binding. The b subunit (SRb) is a 30 kDa integral membrane protein and shows some affinity for SRP and an ability for GTP binding, but its functions in the reception of SRP are still vague. Both subunits are counterparts providing a reliable SR anchoring in the membrane. Two parts of SRP - SRP54 and SRP68/72 - are involved in the interaction with the receptor. There is evidence that the SRP54 binds directly with SR through its G domain (SRP54G). The role of SRP68/72 consists rather in imparting a correct conformation to SRP: defects in this region result in the impaired insertion of a nascent chain into the endoplasmic reticulum membrane. The relationships between the ribosome/nascent chain complex, SRP and SR are regulated by GTP (Bacher et al., 1996). As the scheme in Fig. 18.8 shows, free SRP contains GDP. Initially, the attachment of the ribosome/nascent chain complex to SRP promotes binding of GTP to the 54 kDa subunit (SRP54G), a ribosomal component being involved in this process. In the resulting triple complex, GTP is not hydrolyzed until the complex binds with SRa also loaded with GTP. 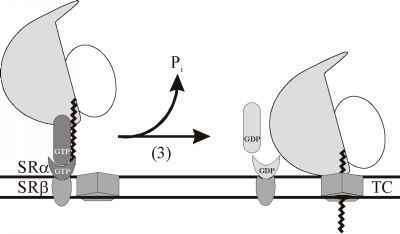 The interaction of SRP, bearing the ribosome/nascent chain complex, with SRa causes hydrolysis of GTP. Since this process occurs in the SRP54 subunit associated both with the signal sequence through the M domain and with SRa through the G domain, it results in dissociation of the ribosome/nascent chain complex from SRP and SRP from SRa. Ultimately, SRP leaves the membrane, whereas the ribosome/nascent chain complex binds to the structure called translocation channel that has to be located on the membrane in the vicinity of SR. The details of this scheme, particularly the order of the events occurring after the binding of the ribosome/nascent chain/ SRP complex with SRa are still unclear. As soon as the ribosome/nascent chain complex becomes free of SRP and associated with the endoplasmic reticulum membrane, the elongation arrest is recalled and the growing nascent chain penetrates into a translocation channel. 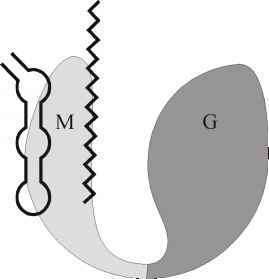 The idea of a transient translocation channel, or tunnel, in the endoplasmic reticulum membrane through which the nascent polypeptide chain is transferred co-translationally was a direct inference from the signal peptide hypothesis (Blobel & Dobberstein, 1975). Since then, many experimental facts and observations have provided a strong support for this model. Moreover, components of the protein complex serving as the intra-membrane "pore" or tunnel (the so-called translocon) have been analysed in detail (see reviews by Rapoport et al., 1996; Corsi & Schekman, 1996; Martoglio & Dobberstein, 1996), and the complex has been visualized by electron microscopy (Hanein et al., 1996; Beckmann et al., 1997). In mammals, the dominant constituent of the translocating channel is the Sec61p complex composed of subunits a (40 kDa), b (14 kDa) and g (8 kDa). In fact, proteoliposomes that include this complex and SR as sole protein constituents are able to perform SRP-dependent translocation of nascent polypeptide chains. The imported chains become resistant to exogenous proteases and can even be processed, if the proteoliposomes contain a signal peptidase in addition to the Sec61p complex and SR. However, some protein precursors need one more protein constituent to be translocated across the lipid bilayer - the so-called translocating chain associated membrane protein, or TRAM, that probably assists in the proper arrangement of the signal sequence in the channel (see below). The mammalian Sec61a is a transmembrane protein; as can be predicted from its amino acid sequence with alternating hydrophobic and hydrophilic stretches, its polypeptide chain spans the membrane 10 times. It is noteworthy that the hydrophobic, presumably transmembrane stretches of this protein contain up to 30% of hydrophilic, polar and charged residues, which makes them potentially capable of assuming the amphiphilic conformation under certain conditions. The mammalian Sec61a is homologous to the yeast Sec61p and the bacterial SecYp (Goerlich et al., 1992; High & Stirling, 1993). 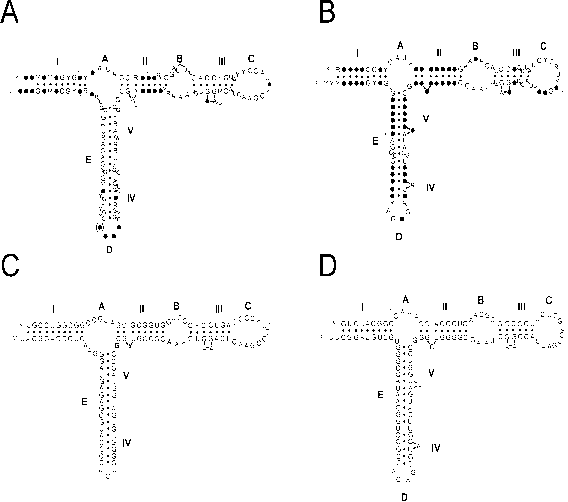 All three proteins are very similar in their membrane topology. As to the other constituents of the mammalian Sec61p complex, Sec61b and Sec61g are homologous to the Sbh1p and Sss1p yeast proteins, respectively. Generally, the mammalian Sec61(abg) complex resembles the Sec61p/Sbh1p/Sss1p complex in yeast. Yeast contain another trimeric complex, termed Ssh1p/Sbh2p/Sss1p, where Ssh1p is a distant relative of Sec61p, Sbh2p is a homologue of the Sbh1p subunit and Sss1p is the common subunit in both complexes. Figure 18.8. Sequence of events initiating the co-translational transmembrane translocation. ( 1 ) The ribosome/nascent polypeptide/NAC complex interacts with GDP-bound form of SRP, resulting in binding of SRP and removal of NAC. 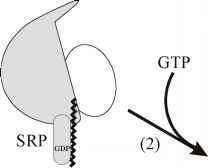 (2) The substitution of GTP for GDP in SRP is induced by the binding. This leads to the appearance of the affinity of the SRP to the SRP-receptor (SR, also in the GTP-boimd form) on the membrane. (3) The interaction of SRP with SR induces GTP hydrolysis which results in dissociation of the ribosome/nascent polypeptide complex from SRP and its attachment to the translocation complex (TC) of the membrane. Concurrently, GDP-forms of SRP and SR dissociate from each other. (A. K. Corsi & R. Schekman, J. Biol. Chem. 271, 30299-30202, 1996).